Shah Rukh Khan wrote an inspiring note to Ayan Mukerji in the year 2005 when he was shooting with Karan Johar for Kabhi Alvida Naa Kehna. Actor Shah Rukh Khan is known to articulate feelings like no other actor can. Director Ayan Mukerji has got proof of the same. In his latest Instagram post, the filmmaker has released a picture of a hand-written note SRK gave to him back in the year 2005 when he was working as an assistant to Karan Johar during the making of Kabhi Alvida Naa Kehna. Recalling the beautiful time, Ayan talked about the big heart that King Khan has and how generous he appears with his words. Ayan wrote in the caption: “Something I saved over the years. SRK’s ever-generous, kind note on this thing I used to carry to work, as an assistant… #keepgoing #keepdoing #keepgrowing” (sic). The note read, “To Ayan: For making movies: Creativity, means the right to make mistakes… Art is knowing which ones to keep… If you stick to it long enough, you will reach where you want to go… like the postage stamp… life itself. Ayan posted another lovely picture of himself sharing a hug with SRK. In the caption of the picture, he has expressed his gratitude for Shah Rukh and just how much he misses being around him. His post reads, “Inspiration. Obsession. Idol. Ayan, who has now become an established director, kept the note for more than 14 years with himself. 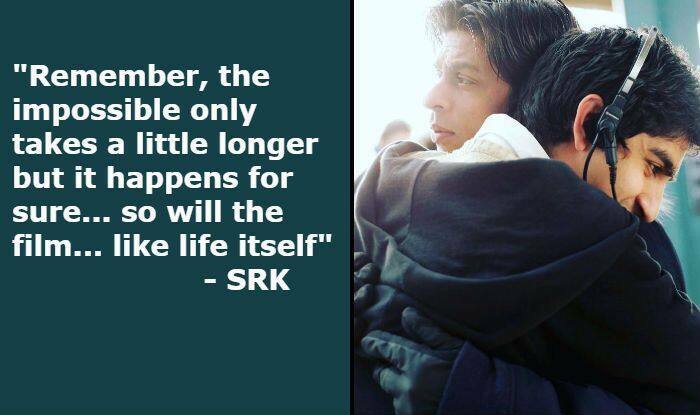 This alone speaks volume of how SRK’s words are just the most precious and special thing for those around him. This also makes us wish for Ayan to direct Shah Rukh soon in one of his films… life has to come full circle after all! On the work front, Ayan Mukerji is busy wrapping up his next directorial – Brahmastra, with Ranbir Kapoor and Alia Bhatt. Actors Amitabh Bachchan, Mouni Roy, Dimple Kapadia, and Nagarjuna are also playing important roles in the film. It’s set to hit the screens on December 20 this year.